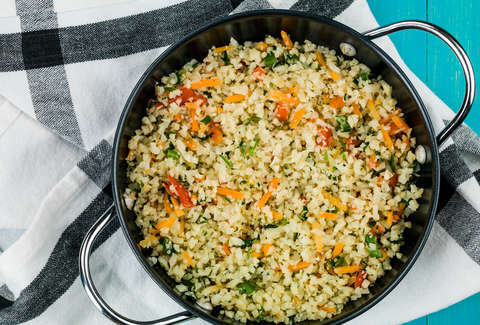 Several states are cracking down on plant-based products labeling themselves as things they’re not; specifically, “meat” or “dairy.” Arkansas is taking it a step further by taking aim at the cauliflower rice craze. The Natural State, which is the nation’s largest producer of actual rice, is taking a stand against broccoli’s white cousin labelling itself as the grain product. Arkansas Gov. Asa Hutchinson is leading the charge, introducing a bill that bans food manufacturers from marketing cauliflower rice as “rice.” The bill is expected to mirror that against plant-based “milk” labeling itself as “dairy,” argued in the “truth in labeling” legislation, which six different states have passed. That means your favorite almond, cashew, and coconut milk producer must now switch up its label and ditch the word milk. Hutchinson’s bill has passed, meaning cauliflower rice producers will have to follow suit when it goes into law in Arkansas. The state’s anti-cauliflower rice legislation will take effect 90 days after the 2019 session ends. Rebellious companies that continue to label the non-grain product as such will be fined $1,000 for every occurrence. Revenue from the fines will go toward the Arkansas Agriculture Department’s Plant Board Fund, according to Cooking Light. Thrillist reached out to Hutchinson’s office for comment, but did not immediately hear back. It’s probably busy work taking down the cauliflower rice industry. This legislation may seem like small potatoes, but to the lawmakers and consumers supporting the bill, it’s a big deal. Rep. David Hillman told the Arkansas Democrat-Gazette, “This law only affects people who want to deceive the public about how their food originated.” He added that so long as companies are “not trying to deceive the public,” they won’t be affected. Supporters of the “truth in labeling” laws hope the bill, and all associated with it, will prevent unknowing consumers from being deceived by confusing product names. While some might argue that it’s pretty clear that things like cauliflower rice and cashew milk contain neither rice nor milk, legislators seem to have less faith in shoppers. A recent survey of consumers in the United States and United Kingdom supports the thinking that shoppers are capable of making decisions for themselves when it comes to purchasing meat, dairy, and grain replacements. It found that 75% of consumers were supportive of labeling vegan meat alternatives with “meat”-related terminology, according to Cooking Light. Jessica Almy, director of the Good Food Institute, told The Wichita Eagle the new policy is “bad.” She added that consumers are perfectly capable of figuring out which products to buy, based on dietary needs and preferences. If they weren’t, Almy said, they wouldn’t buy them. It’s unclear what cauliflower rice will be called under the new legislation. You’ll have to check it out next time you head to the grocery store to get your non-grain fix.